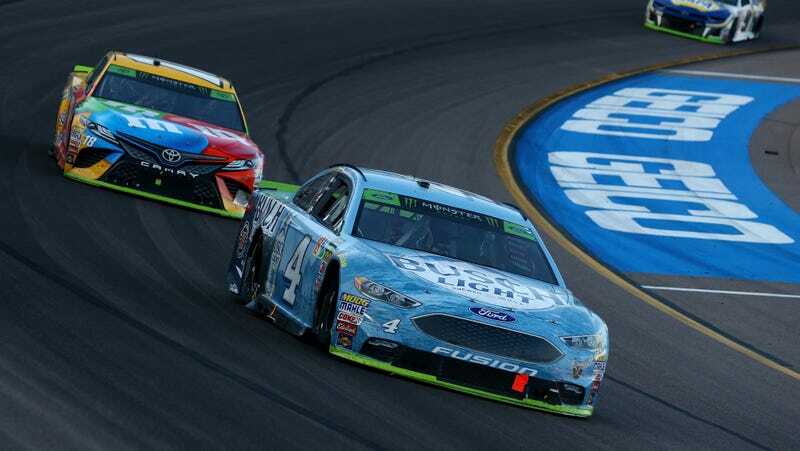 Kevin Harvick and Kyle Busch racing in Phoenix, the final race before the Homestead-Miami Speedway championship. Everyone you know probably jokes that in NASCAR, the person who makes the best left turns is the champion. But deciding the NASCAR champion is far from that simple these days, to the point that you might need a guide to fully grasp what’s going on. Good thing you found one, right? Yes, yes, I know, we’re doing that bit from Baseketball again. Here we go. NASCAR’s at Homestead-Miami Speedway in Florida this weekend for its final event of the year, with its top three levels running a race: the Camping World Truck Series on Friday, Xfinity Series on Saturday and Monster Energy NASCAR Cup Series on Sunday. The championship in each series depends completely on what happens in Miami, unlike most other motorsports and much like the Super Bowl in football. All of the drivers left in NASCAR’s “playoffs” start from scratch, and the one who does the best in Miami wins it all. It’s a bittersweet thing, if you’re a motorsports fan. It means that every race in Miami will be interesting because it almost ensures no one wins the title until the race is over, but it also takes out the typical approach to motorsports where the person with the most points across the season is the champion. In all three series, there are four drivers left racing for the title. In the Truck Series on Friday, it’s Brett Moffitt, Johnny Sauter, Justin Haley and Noah Gragson. In Saturday’s Xfinity Series, it’ll be Cole Custer, Christopher Bell, Tyler Reddick and Daniel Hemric. In the main Cup Series event on Sunday, it’s between Kevin Harvick, Kyle Busch, Martin Truex Jr. and Joey Logano. Everyone else has been eliminated, but they’re still racing. There are only four drivers who matter for the title, but the rest of the field is still out there racing because they have sponsors to please, people who planned to work this weekend and an all-important battle for 13th place in the final standings to compete for. In each series, the highest finisher in playoff contention wins the title. There are no more races, nothing else counts toward this and everyone left racing for the title starts at zero, basically. The points during the race don’t matter in deciding the champion, only the finishing positions do. If all four people in title contention wreck at the same time, it will get sort of messy. If the person who wins the title gets “disqualified” after the races, things will get even messier. Cup Series title contender Harvick had a win “taken away” (it’s complicated) recently during a Wednesday post-race inspection after his victory at Texas Motor Speedway, and if the title winner did something that NASCAR didn’t like, NASCAR said it would take the title away. That might all sound like a lot, but modern NASCAR is a lot to take in. It makes things interesting, if you know how to follow said things. At the very least, you’ve now got a cheat sheet to look at.